The California Condor is the largest bird in North America and at one point was nearly extinct. 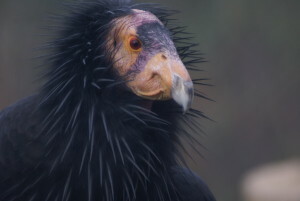 In the 1980’s, the population had dropped to 20 of these Condors, but now, thanks to captive breeding programs, the California Condor is making a comeback. Frequenting isolated, rocky ledges and cliffs in the Southern United States, the California Condor is a bird whose diet consists mostly of carrion. Occasionally the Condor will take a rodent or fish, but its talons are too weak to kill anything else. Usually feeding on dead buffalo, deer, or other large carcasses, Condors provide a valuable service in waste disposal. 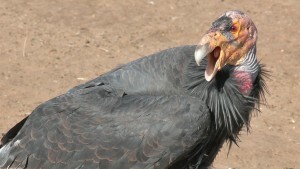 In captivity, California Condors are fed dead cattle and sheep. After eating, the California Condor is too heavy to fly and must remain on the ground, where they fastidiously clean themselves by rubbing their heads and necks on vegetation or rocks. Condors can go for days without eating, but when they do eat, may ingest up to two pounds of food! 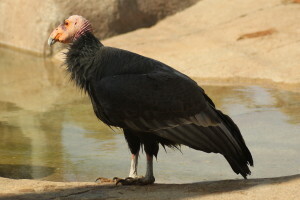 California Condors also bathe frequently and sun themselves dry. Their nests are usually simply gravel scrapes in caves or rock outcroppings, and the word “nest” is rather inappropriate in describing it. California Condors make wheezing or grunting noises to communicate. Occasionally, California Condors fly into power lines and are killed, and human destruction of their habitats has been a crushing blow for these beautiful birds. The loss of these gentle creatures has been prevented only through the strenuous and dedicated efforts of many wildlife funds, zoos and individuals. The California Condor is a huge bird covered in dull gray or black feathers. Generally, these Condors grow to be 46 to 55 inches, with a nine point eight foot wingspan! 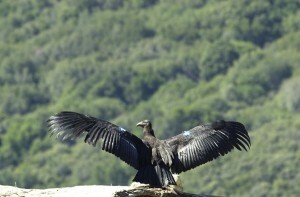 The wings are gray on top but have distinctive white-marked undersides, which are visible, when the Condor soars. Because of its huge wingspan, the California Condor is capable of attaining 15,000 feet in altitude and flight speeds of 55 miles per hour! Generally, California Condors weigh 20 to 30 pounds. Their featherless heads and necks are a yellow to orange color, and their bills are white. The California Condor has pink legs! Immature Condors have dark heads, necks and wing undersides. California Condors once ranged over the entire Southwestern United States but now reside only in arid regions of California and Arizona and in zoos. Traditionally, they were revered as sacred birds by Native Americans and may have been used in rituals, but with the European settlement of the West, became nearly extinct. Pesticides like DDT in addition to poaching, habitat loss and poisoning killed off a huge number of Condors. Protected by the Endangered Species Act, their numbers had nevertheless dwindled down to 22 wild birds in 1987. Captive breeding programs have had phenomenal success at reintroducing these birds into the wild and now 120 California Condors are in existence. California Condors begin breeding at seven or eight years of age and lay their eggs in gravel patches of caves or cliffs. These Condors do not breed every year and lay only one egg between February and May. Both parents incubate the egg, which will hatch after about 59 days. Both parents also feed the hatchling with regurgitated material. At five to seven months, the baby California Condor will begin to fly but will not be independent until it is more than one year of age.